Do you need a hypoallergenic down alternative comforter? 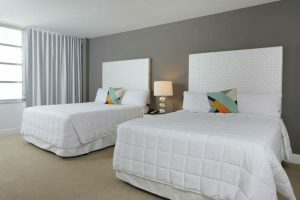 Then, the Linenspa White Goose Down Alternative Comforter might be perfect for you. 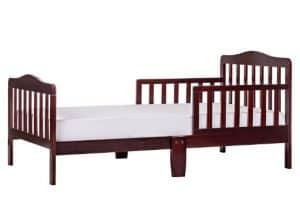 It is fitted for queen-size beds and offers ultra-soft comfort. 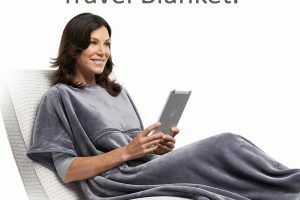 The microfiber fill is designed to give you the right amount of warmth during cold nights. This comforter is made with hypoallergenic fabric, and the exterior is designed with a plush microfiber fabric for optimum comfort. This comforter has a good price given its excellent quality. If you want to invest in a good comforter for cold nights during winter, then this product might be the perfect choice. You can keep this comforter clean by washing it in the washing machine and dryer. Remember that if you clean this in the washing machine, make sure to use the gentle cycle so that you’ll not destroy its construction. It is recommended to use cold water to prevent shrinkage. In drying this item, you can either use a dryer or sun dry it naturally. If you use a dryer, select the lowest setting. This might take about 3 hours, but this amount of time is needed if you don’t want mold to develop in your comforter. You may also add a few tennis balls in the dryer to prevent the alternative-down from clumping. At 5.1 pounds, this comforter is quite lightweight given its large size and thick filling. This makes it easy to move as you sleep in your bed. Just imagine a heavy comforter placed on top of you. Quite a discomfort right? This comforter’s lightweight design is enhanced by its microfiber filling which also offers a sufficient amount of heat to keep you warm you on the coldest nights of winter. The sewn corner tabs help keep the duvet cover in place, solving your problem of slipping duvet covers. Also, the box-stitch design keeps the microfiber material from clumping or shifting. This helps retain the shape of the comforter after many washes. Best of all, this product comes with a 3-year warranty which covers all defective materials. With this warranty, your comforter will be insured for 3 years. A few customers reported that this comforter might be too warm for summer nights. This is expected since this comforter uses polyester, which is a synthetic fabric that is not breathable. If you still want to use this comforter on summer nights, you may want to use cotton sheets to have something draw off the moisture. Cotton is a naturally breathable fabric that can keep you cool during hot summer nights. Some owners noted that this comforter generates static electricity—if you rub your skin across the comforter, small lights or sparks occur. This is normal for polyester fabrics. However, if you find this unsettling, you can find other brands which offer a blended polyester fabric to subdue static electricity. You may want to try the Queen Comforter Duvet Insert White by Utopia Bedding. A few users reported that the fabric of this comforter is slightly porous, though not visible to the eye. As a result, some microfiber polyester escapes from the fabric and floats into the air. This could lessen the polyester fill if this continues. If you want a more secure fabric to contain the polyester fill inside, then the All Season Down Alternative Full/Queen Comforter might be your next option. Several owners noted their comforters ripped after they put it in the washing machine. Although no further details were provided, the main cause of this problem could the wrong way of washing this product. As prescribed, you should wash this comforter under gentle cycle and use cold water. If you miss following this instruction, then there is a high chance that you’ll end up with a worn-out comforter. As compared to the Utopia Bedding Queen Comforter, the Linenspa White Goose Alternative Comforter is a bit larger and less expensive. While Utopia Bedding uses polyester blend materials, Linenspa uses 100% polyester making it warm during the summer and generates static electricity. However, the Linenspa offers a 3-year warranty which the other brand doesn’t offer. On the other hand, the All Season Down All Season Down Alternative Comforter is more expensive than the Linenspa. It is also smaller as compared to Linenspa by 2 inches in width, though both uses hypoallergenic materials and polyester fill. The All Season comforter might be heavier than Linenspa by 2.4 pounds. Like Utopia Bedding, the All Season fails to offer a warranty to its customers like the Linenspa does. 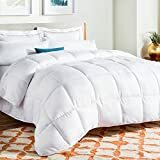 If you need the hypoallergenic features of a polyester comforter, then the Linenspa White Goose Down Alternative Comforter might be perfect for you. It comes with a 3-year warranty, making it easy to resolve some issues that might emerge after you use it regularly. Although this may not be suited for summer, this is not a big deal because you can still solve this with cotton sheets to draw moisture away from your body. Besides, this has an economic price that fits a limited budget.